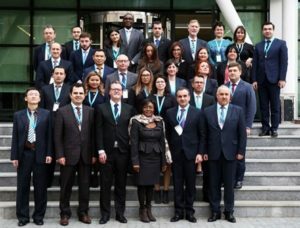 The second meeting of National Contact Points (NCPs) for Capacity Building in the WCO Europe Region was held from 28 to 30 January 2019 at the WCO Europe Regional Office for Capacity Building (ROCB), in Baku, Azerbaijan. Delegates from 21 WCO Europe Region Member Administrations, representatives of the WCO Secretariat and ROCB participated in the meeting. The meeting was officially opened by the Deputy Chairman of the State Customs Committee of Azerbaijan, Mr. Igbal Babayev. In his welcome remarks, Mr. Babayev stressed the importance of capacity building in customs and highlighted the reforms that are being implemented by the State Customs Committee of Azerbaijan. The Deputy Director of Capacity Building Directorate Mrs. Brenda Mundia gave opening remarks where she stressed the importance of such regional meetings. She highlighted that the aim of the meeting was to deepen and update the participants’ knowledge on the WCO Capacity Building programmes and initiatives, enhance awareness on the role of NCPs in the Capacity Building domain and to further enhance the network of the NCPs in the region and cooperation between Members, the ROCB and the WCO. During the meeting, the ROCB reported on its activities, challenges and proposals to strengthen its role. The WCO led discussions on capacity building programmes and delivery including updates since the previous meeting. Some NCPs shared their national experiences on capacity building and training activities. The meeting discussed the question of how to enhance the role of ROCB Europe. The participants underlined the need for closer and enhanced cooperation especially on regional capacity building initiatives. Regional priorities and correctly assessing the results and impacts of activities were among the matters that were considered. It was also highlighted that the ROCB Europe would play an important role in coordinating these initiatives in collaboration with the WCO Secretariat. There was also consensus on establishing mechanisms for better communication among the NCPs. The meeting further agreed to define Terms of References that would specify the role of contact points and to present to the Conference of the Directors General for endorsement.